Prominent journalists in the United States may as well be on the White House payroll. They are consistent cheerleaders for whoever occupies the oval office and the corporate corner office. They make no attempt to hide their allegiance to power and their lack of interest in informing the public. The rotten state of affairs becomes all too obvious whenever a president threatens action against another country. Reporters act more like press agents and spring into action shielding and protecting the aggressors. They make it clear to those few who gain access that questions, criticisms or anything else that smacks of independent thought will not to be tolerated. The American decision to use Ukraine as a means of attacking Russian influence is the latest effort to prop up the empire, and the corporate media obligingly show their approval. CNN’s Christiane Amanpour was so eager to fly the American foreign policy flag that she pointedly took a colleague to task on air when he was guilty of nothing more than doing his job. Wolf Blitzer is a corporate media stalwart himself so he and everyone watching was surprised when Amanpour jumped down his throat when he quoted a Russian official. ‘You know, you’ve got to be really careful by putting that across as a fact,’ Amanpour said. ‘That’s what Vitaly Churkin said,’ Blitzer replied. ‘Of course not,’ Blitzer defended, explaining that he was presenting what Churkin had said. ‘Right, and we have to be very careful,’ Amanpour cautioned. Blitzer tried to interject, offering to play Churkin’s comments again. Amanpour had lots of company at other networks. Gwen Ifill of PBS Newshour also stuck to the White House script with her guest, professor Stephen F. Cohen. Cohen informed viewers that American presidents going back to Bill Clinton have been playing a very dangerous game in their attempt to pry Ukraine from the Russian orbit. The so-called journalists who are held up to us as exemplars of success and profession acumen are by and large hacks who toe the party line. Ifill has a long standing reputation of defending presidential policy in her reporting. She is at least consistent. Just as she followed the Bush doctrine she is now in synch with the Obama team. Amanpour vilifies her colleague on air for cynical reasons and Ifill plays dumb if a guest dares to speak up with real analysis. All their behaviors are an effort to diminish any debates or arguments against the United States government. The only critics on the air are questioning whether Obama is tough enough and if American “prestige” is on the line if we don’t have as much violence in the world as they would like. Now that the United States government has officially declared war on the rest of the world, Americans are in desperate need of truth telling. But that is not how empires work. 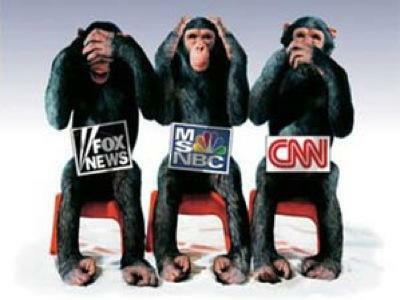 Ifill, Amanpour and company flourish precisely because they do not tell us the truth. It is not too harsh to point out that the propaganda and lies spread by networks and newspapers are part of an enormous crime. America is the evil doer in Iraq and Haiti and Libya and Venezuela and Ukraine. Nations are invaded and economies are ruined because our government is determined to have its way in the world. The crimes are committed with impunity in part because presidents get a helping hand from their corporate media partners. The only thing making Americans squeamish about military involvement against Russia is war weariness. They don’t oppose it on principle because they don’t know what the principles involved are. Just as we aren’t the richest country in the world, and we don’t have the best health care in the world, we don’t have the best press either. We have a government that is more aggressive by the day and they have a mouth piece which we call the media.